So you can see the term undergraduate simply means a program of study taken after high school and before graduate level studies. Other than when the degree program happens, there are several characteristics that differentiate undergraduate programs from graduate programs. First, undergraduate classes are more general in nature. You will have a specific area of study (called a major), but there are a wide variety of classes you must take that have nothing to do with your chosen area of focus. Graduate programs are highly focused and delve into the specific area of study at a much deeper level. One thing you will also notice is that undergraduate classes are much larger than the graduate level classes (or the ones you experienced in high school either). Some of the general core courses you must take can number into the hundreds of students per class. This makes getting focused one-on-one time with the instructor nearly impossible. It’s fairly easy to change your undergraduate degree. Students do that all the time. In many cases you can change up until your junior (3rd) year without delaying your program. Graduate programs are highly specialized. Should you choose to change majors, it might require taking some additional courses at the undergraduate level in order to be accepted into another program. Finally, while they both involve time in the classroom sitting through endless lectures, graduate programs are more research oriented than undergraduate programs. Some also have comprehensive examinations or dissertations (a written research paper) that you must pass in order to earn your degree. This used to be an easier question to answer. You really couldn’t get anywhere in your career without an undergraduate degree of some kind. Now though it’s not so much of a slam-dunk. Advances in society and in technology have made it easier for kids out of high school to find work that can lead to a profitable career. That coupled with the high cost of a college education have made many reconsider whether to pursue a degree. In general, an undergraduate degree still makes sense. Employers will look more highly on someone with an undergraduate degree than they will on someone with only a high school diploma. Generally speaking, a college degree leads to better careers and the chance to make more money. And if you plan on going into a field that requires a Master’s or higher level of education, than an undergraduate degree is a must to prepare you for what lies ahead. There may be other scenarios where an undergraduate degree doesn’t make sense. You need to weigh the pros and cons of college to see if going is right for you. The big thing to realize is that there is no rush to make a decision if you are unsure. You may feel pressure from others but the last thing you want is to spend a lot of money and go into debt for a degree that will have no benefit for you. 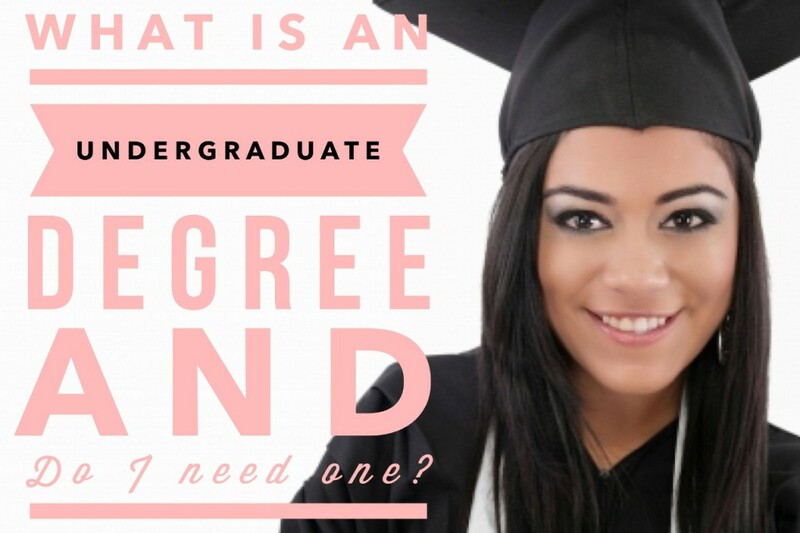 Questions: Do you think an undergraduate degree is worth it? What other reasons might someone have for not getting an undergraduate degree? What was the biggest challenge you faced with your undergraduate or graduate degree? Would you take the same educational path again if you could go back and change it? Brian, good overview of college. I think gaining education is worth the effort, but don’t believe it’s worth the debt. I have too many friends who financed an undergraduate degree from a private Christian college then went on to seminary to finance another degree. Now they’re over $100k in debt making $30k as a new associate pastor or neophyte counselor somewhere. It’s daunting. Can you pay cash for undergrad even if your parents aren’t helping or don’t have scholarships? Yes, but school selection is a huge part of that. Go to an in-state or community college and work…a lot. That’s what I had to do. Was the education valuable? Absolutely. Do I make more now because of it? Yes. So, I think college education is valuable. But it being valuable does not warrant the debt load so many are carrying. Undergraduate degree is really important nowadays and this century. The competition in industries is really tough and the only way to be above the rest and have an edge is having a degree. The more degrees we have, the better. I’m still pursuing my undergrad and I have to say, as I am getting closer to graduation, I am enjoying my classes plenty more. I love learning about topics related to my major, instead of general courses unrelated to my educational learning. “…getting closer to graduation, I am enjoying my classes plenty more.” I did too Alexis. The major classes I took my junior and senior year were far more enjoyable than the core classes I took early on. I think it’s this way because you are finally studying about and honing in on the career path you want to pursue..and that’s exciting. I think for a large majority of people it would be a big mistake not to get a college degree. It make sense for a large majority of high school students, even those who have “no idea” of what they want to do with their life. I do think you should consider going to a lower-cost school if you need to take out loans for 100% of your degree. “…consider going to a lower-cost school…” I agree DC…especially if they have no idea what they want to major in. They can always take the core classes at a cheaper school until they decide. In my opinion, society has changed so drastically, like you said about the advancements in technology and such that kids can prove so many of their capabilities outside of college that I won’t be suggesting college for my children when they are of age. My brother-in-law is in major debt because of his school loan and can’t seem to dig his way out. I never went to college but built my own business and have very little debt. College USED to be important, for the majority I don’t think it is anymore. Tell me if I’m wrong. “…major debt because of his school loan…” The average school debt is simply skyrocketing. It’s hard to believe how expensive college has become. It’s also crazy that kids/parents don’t seem to care and continue to take out loans to pay for degrees that lead to no substantial return on investment (i.e. degrees that lead to low paying jobs). I still believe college has value and most career tracks will require some degree. But I couldn’t argue that it’s for everyone. Thanks for sharing Warren! I would say I lean way more towards yes than no. I mean technically I could have gotten away with a technical college or training to do what I do (especially now that it’s all on home computers), but I wouldn’t trade the experience of college for the world. It literally saved my life! I think the degree question really depends a lot on what one plans to do for a job. Our oldest is set on being a comic artist, and already has many of the skills that she needs to be one, even though she’s only in 9th grade. So for her, we’re focusing right now on getting her connections in the industry. School might come later, but for now, her “business” is making money, so we’re making the business the primary focus. Great post, Brian. Laurie recently posted…How One Man Dumped $75,000 in Debt in Just ONE Year! “…getting her connections in the industry.” That’s a good strategy Laurie. I think this is becoming more and more important. There is so much competition. Having an insider who can vouch for you is a big deal. Helped my wife land her current job. Well it depends on which field you get your degree in. Although there are exceptions of course, a degree in art history, gender studies, or minority studies is not going to get someone a job. And lets be realistic, 99% or college graduates need a job after graduation. If you get a degree in engineering, or biomedical research etc. you will probably have a job waiting for you when you get out of school…especially if you get a graduate degree. There are other alternatives to college for a huge number of people who would actually be better of if they entered a trade school. Vocational schools are seriously undervalued in our society today but they provide a fabulous service by training people to be auto mechanics, HVAC technicians, plumbers, electricians; and even many jobs in the medical field can be prepared for in a trade school. “…art history, gender studies, or minority studies is not going to get someone a job.” Yeah…I always wondered about those type of degrees. What type of jobs do they actually lead to anyway? It has been proven time and time again that the vast majority of undergraduate degrees are worth it. You simply make more money over your lifetime if you have a degree. The statistics don’t lie! That’s what I’ve seen too Holly. There will always be a success story here and there of someone who didn’t finish college making it big time. But those are few and far between. Yes, I can say that undergraduate degree is totally worth it. When my hubs finished his associate 2 year diploma course, he tried to look for a job but he really had a hard time to find a job so he decided to pursue a 4 year bachelor course and when he graduated he was automatically got a job from a good company. Agreed Clarisse…those with a four year degree will have an advantage over those with only a two year.